Yen Choong joined Ding Ying Music Company in 2007 and is currently the concert master and gaohu musician of the Ensemble. Yen Choong's musical journey began when he started learning the Pipa from Mr Toh Kok Chun in 1988. He has since been active in the Chinese music scene, performing in numerous concerts including Pipa solo and duet as a member of Chin Kang Huay Kuan Chinese Orchestra. In 1992, he participated in the Music Instrumental Competition and was awarded 2nd runner-up in the Junior Category. He also came in 3rd and 2nd in the Pipa Category of the National Music Competition in 1993 and 1995 respectively. In 1999, Yen Choong started learning the Erhu from Ms Xu Wenjing. A highly talented musician, he quickly acquired a high level of skill in the instrument. 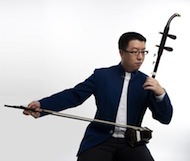 Since joining the Keat Hong Chinese Orchestra in 2000, he has been featured as a soloist in various performances playing the Erhu and Banhu both locally and overseas. In 2002, Yen Choong took part in the National Music Competition and was awarded 2nd runner-up in the Erhu Open Category and lead Ding Ying Music Company to win the Ensemble category in 2008. In 2003, he represented Singapore for the International Jiangnan SiZhu conference in Taicang, China. In 2004, he was selected to represent Singapore to Laos PDR to participate in the annual ASEAN Youth Camp. In the same year, he attained the Diploma in Erhu performance, jointly organized by Nanyang Academy of Fine Arts (NAFA) and Central Conservatory of Music (China). He was the recipient of the Arts and Cultural Scholarship awarded by Singapore Hokkien Huay Kuan for his diploma studies in NAFA. Receiving the National Arts Council (Singapore) Arts Bursary, Yen Choong is the pioneer batch of Chinese instrumentalist to attain the B.A (Hons) in Music at NAFA. Yen Choong studied orchestra conducting with Mr. Eric Watson, Dr Robert Casteels and renowned Hong Kong conductor Mr. Wai Sing Fat; and had since then conducted orchestras in various performances. He is currently conductor and instructor of various schools. Watch Yen Choong in action playing the Erhu below! Feeling inspired? Take a one time trial lesson with us!